Boultham Junction from the Greetwell Junction direction, with the junction signal in the foreground. The distants were for Pyeweipe Jct (L) and West Holmes (R); the latter was fixed at caution and hence had no green spectacle glass. The red glass of the branch home appeared white due to weathering and fading of the plastic used. A closer view of the signalbox and the line to Pyewipe Jct, whose starter can be seen in the distance. 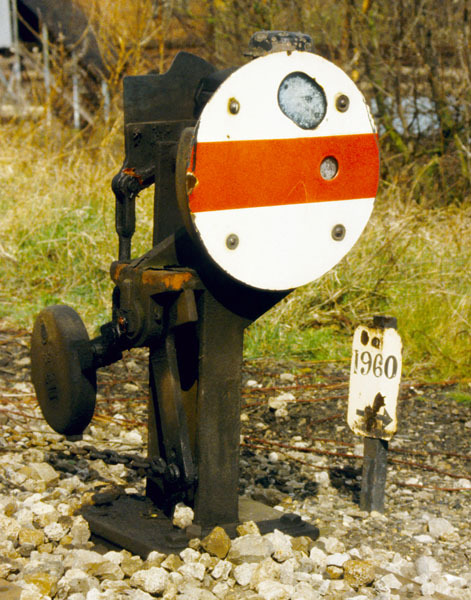 A close-up of the disc for setting back across the crossover. 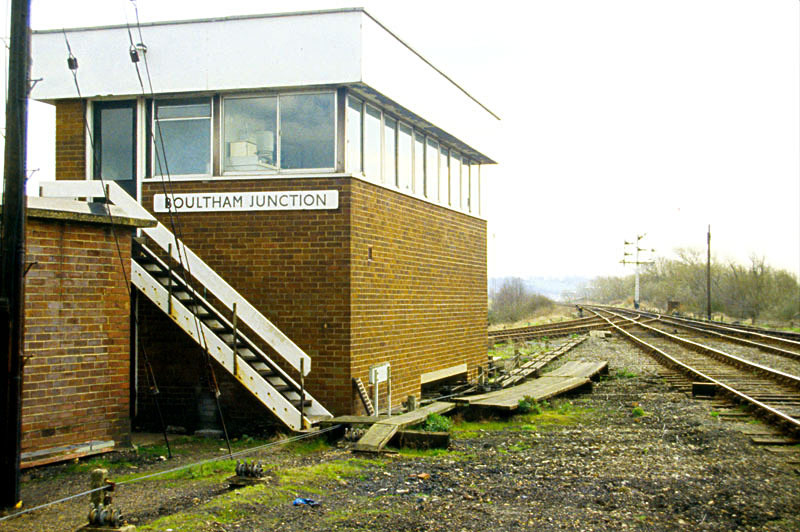 The up home from Pyewipe Jct, which was also Boultham Jct's section signal. The subsidiary arm below was a calling-on signal, because the goods-only avoiding line to Greetwell Jct was worked by permissive block. 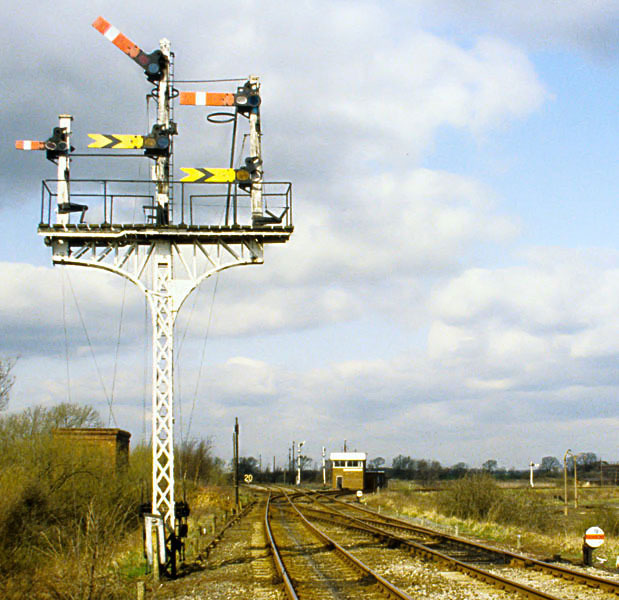 The post on the left was used for the exit signal from a former goods loop which had previously been lifted. 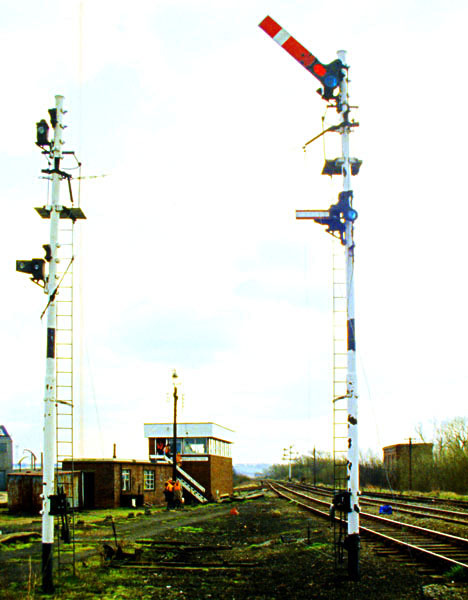 Normally, in semaphore working, only one train is allowed in the block section between two adjacent signalboxes. This is called absolute block. Permissive block allows more than one train to be in a block section simultaneously. 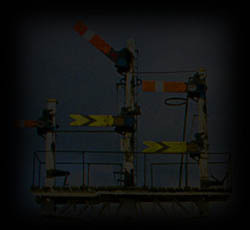 Calling-on signals are used to warn trains entering already occupied sections that they must proceed on sight and be prepared to stop short of the train in front. Historically, permissive working was used extensively on freight-only lines, but nowadays it is mainly confined to station platforms, for coupling/uncoupling moves or to allow short trains to share long platforms. Inside the signalbox. The levers controlled the points, signals and other equipment. Each lever's colour indicates what type of item it operates. Basically, red levers are for stop signals, yellow for distant signals, black for points, blue for facing point locks, and the white ones are spare, unused levers. The ones with black and white chevrons control detonator placers. Above the lever frame is the block shelf. 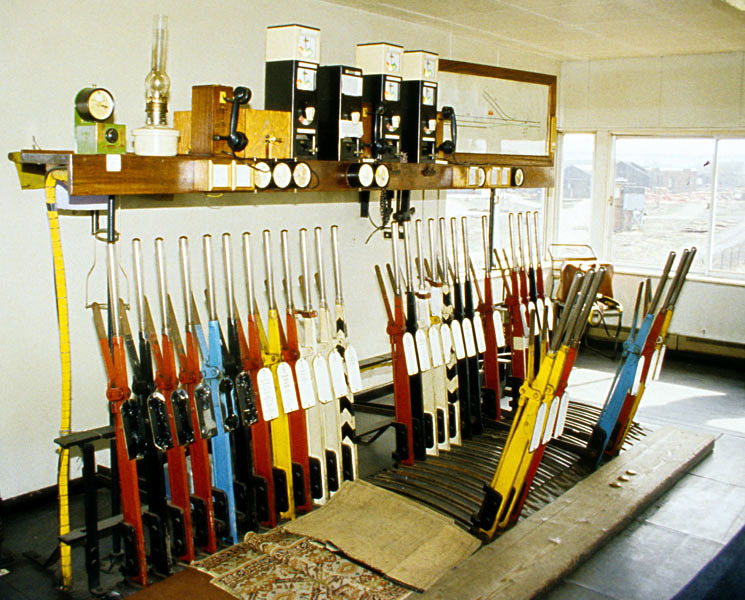 Block instruments and bells, used to communicate with the adjacent signalboxes, are mounted on the block shelf, while various types of indicators and plungers are affixed to its front. 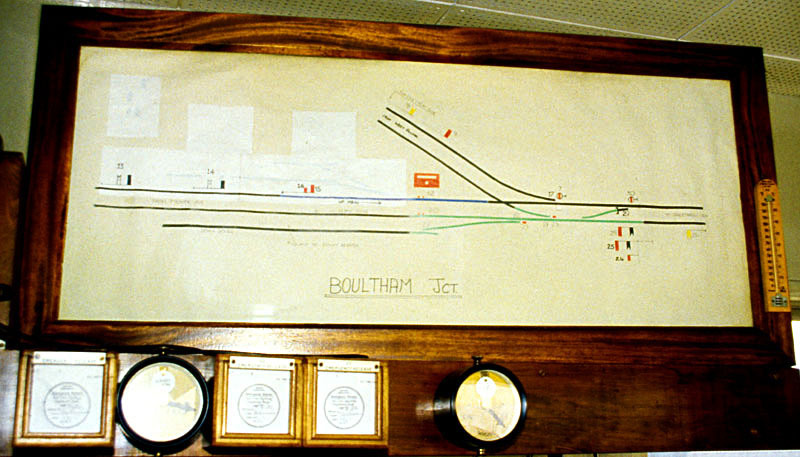 The other essential feature of any box is its signalbox diagram, a detailed drawing of the track layout showing everything controlled from the box and any other essential information. Here, it can been seen to the right of the block instruments. Every lever has a plate attached to it which describes not only what the lever operates, but which other levers must be pulled before the interlocking will allow it to be reversed. These are called lever leads. The three in the foreground are the levers for the up main outer distant, inner distant and home (the signal shown above with the calling-on arm beneath it). These were the signals for trains travelling from Pyewipe Jct towards Greetwell Jct. 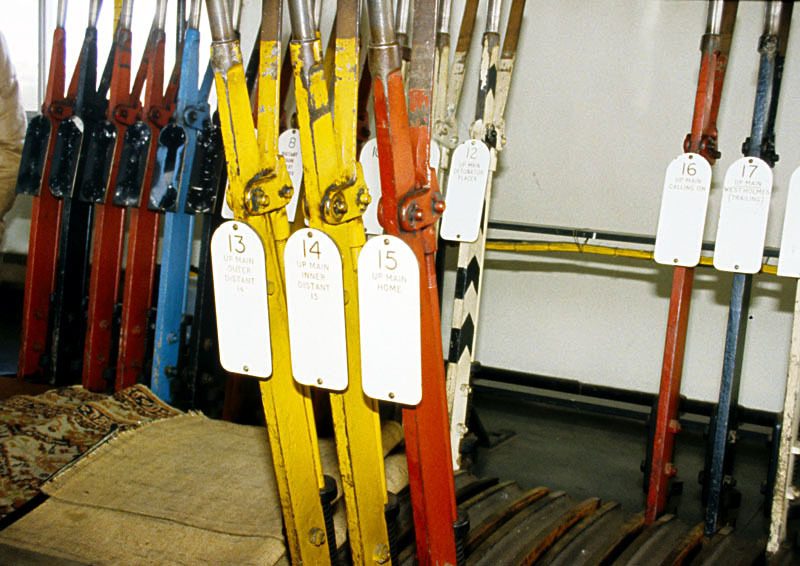 By 1983 it was quite rare for a signalbox to have separate levers for inner and outer distants - usually they would both be controlled from the same lever. If you look closely at the leads you will see that 14, the inner distant, requires the home 15 to be cleared first, and the outer distant 13 in turn requires 14 cleared first. So you could only clear these signals from right to left. 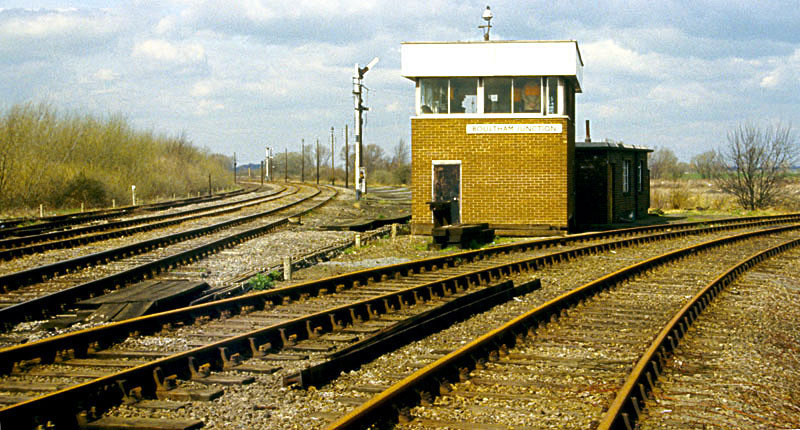 Each signalbox has a block instrument for each section of line to/from an adjacent signalbox. Where sections are double track, the instruments for both lines are often combined in a single cabinet, as on the standard BR-design instruments used here. Under absolute block working, each section of line is always in one of three states: normal (or line blocked), meaning the line is unoccupied but nothing has been signalled; line clear, meaning the signaller at the exit from the section has given permission for a train to be sent; or train on line, when a train is currently in the section. The state shown on the instruments is controlled by the signaller at the exit from the section - on these BR instruments this is done by turning the commutator knob. The instrument at the entrance to the section has only a needle dial which repeats the state that has been set by the signaller at its exit - these are the top needles with the white cabinet surrounds. The instrument on the right controls the lines to/from Greetwell Junction; because these are permissive blocks, their train-on-line indications carry the words line occupied and have yellow backgrounds instead of red ones. Each of these instruments also includes a single-strike bell and a tapper. 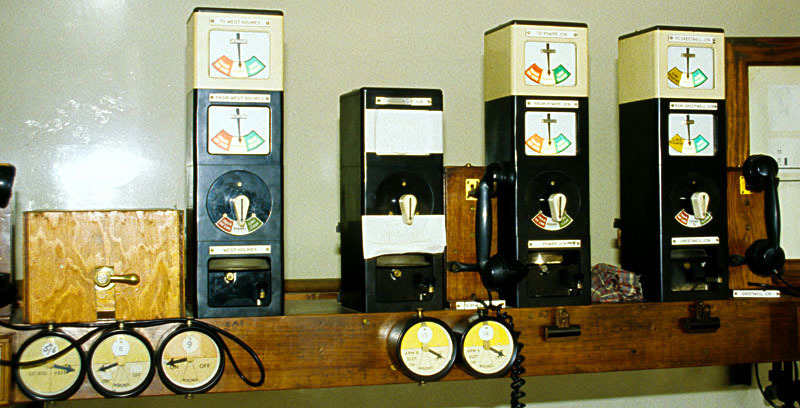 The bells are used by the signallers to communicate messages to control the running of the trains; each (pair of) sections has a separate bell so there is no confusion over which line the messages relate to. The signalbox diagram. The line to Pyewipe Jct is at the left, to Greetwell Jct on the right, and the branch to West Holmes above. The dials beneath the diagram are signal repeaters which show the actual states of the signal arms. The square boxes contain sealed release plungers for use in emergencies or following equipment failure. A view past the signalbox towards Greetwell Jct. 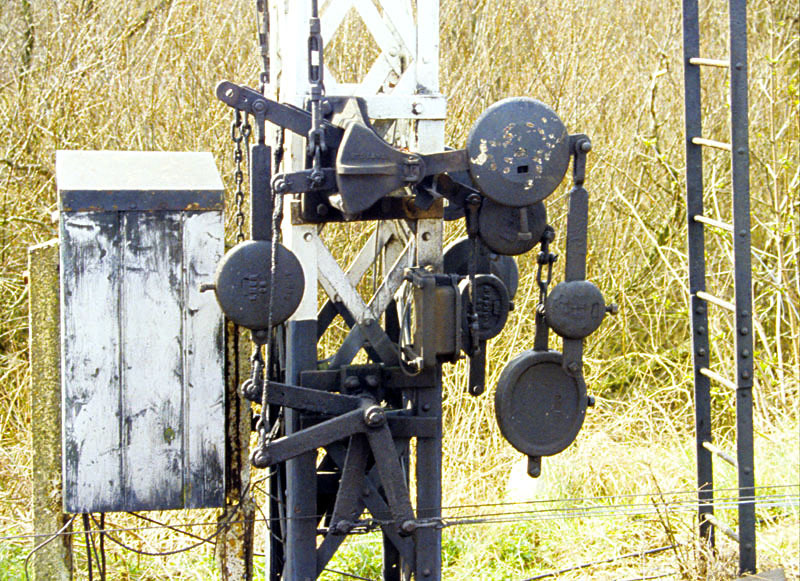 The slotting equipment on the post of the junction signal. This prevented Pyewipe Jct's distant from showing clear unless the stop signal above it had also been cleared. Thanks to David Ingham for providing the explanation of the white appearance of the red spectacle glass of the branch home on the junction signal.